Background: Carbon nanoparticle (CN) suspensions have been widely used as lymph node tracers in cancers. Here, CN suspension was successfully applied to lymph node dissection. Objective: This study aimed to evaluate the role of CN suspension in identifying lymph nodes and preserving the parathyroid in patients with papillary thyroid cancer (PTC). 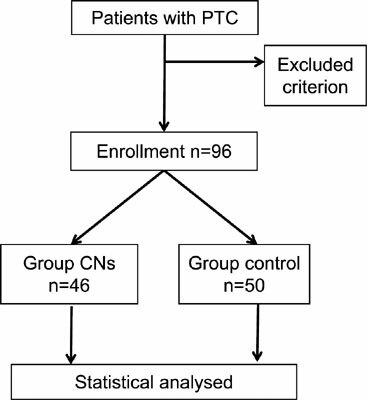 Method: A total of 96 PTC patients were divided into a CN group (n = 46) and a control group (n = 50). All patients underwent total thyroidectomy with central lymph node dissection from 2014 to 2015. Results: The number of lymph nodes removed in the CN group and the control group was 9.6±2.4 and 7.8±2.2, respectively, and the number of dissected lymph nodes identified as <5 mm in both groups was 4.4±1.3 and 2.4±1.4, respectively. These results were significantly different between the two groups (P < 0.05). However, the number of metastatic lymph nodes was similar in the two groups. In addition, the results further revealed that the level of serum parathyroid hormone (PTH) was significantly lower in the control group than in the CN group on postoperative day 1 and week 1 (P < 0.05), but similar outcomes were observed at postoperative month 1. Conclusion: CN suspension plays an important role in accurately identifying lymph nodes and protecting parathyroid glands. The clinical utilization of CN suspension could increase the accuracy of surgery programs and protect parathyroid function. Carbon nanoparticles, papillary thyroid carcinoma, total thyroidectomy, central lymph node dissection, parathyroid, recurrent laryngeal nerve.